This is a new OEM Hitachi Mass Air Flow meter (MAF) for the 2.7t engine. Great for replacing a bad unit or for upgrading from a less reliable Bosch MAF. 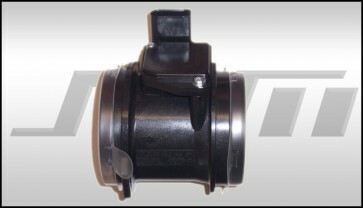 OEM part number 06C 133 471 A. Includes: New MAF electronics, New MAF housing and 2 New T20 tamperproof torx bolts for bolting the MAF electronics on.